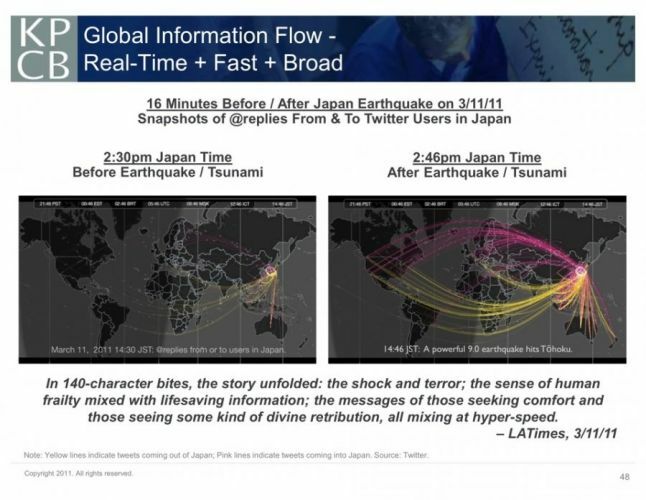 Information today is real-time, fast and broad as evidenced by information flowing after the Japan tsunami. For more on global trends, visit http://www.kpcb.com/internettrends2011. I read some interesting numbers about the internet earlier this week. They were from Mary Meeker, a partner at the venture-capital firm Kleiner Perkins Caufield & Byers. She presented on industry trends at the Web 2.0 Summit, a conference of the tech industry’s leading thinkers. In three years, China added more Internet users than exist in the United States. The biggest adders were China, India, Nigeria, Russia and Iran. Social networkers exceed internet users, and 70 percent of them use Facebook. Smartphone usage still has a huge upside. There are 835 million smartphone subscribers and 5.6 billion mobile phone subscribers. iPods changed the media industry. iPhones became bigger and more popular even faster than iPods. iPad growth leaves its “siblings” in the dust. “Sound is going to be bigger than video,” says Alexander Ljung, founder and CEO of SoundCloud. Content is about global information flow. It’svreal-time, fast and broad. How will these trends impact how you do business? Planning is the simplest one. You need to know where you are going and how you are going to get there. You book your flight, hotel and ground transportation. But you also have to plan what to pack based on the weather. If you’re flying overseas, you need to research and find out if you need a visa and what is required when you go through customs. Traveling teaches us that it’s important to have a plan to succesfully arrive at your destination. Adaptability is the norm of travel today. If your flight is cancelled or delayed, you have to adapt. When it comes to meals, you have to adapt to the food that is available. I spent a week in the Midwest, which is known for its excellent beef, but I don’t eat red meat. Baked potatoes were my go-to food. Overseas, I adjusted to different toilet styles (enough said!). The lesson is clear: If you aren’t adaptable, you aren’t going to have a successful trip. Communications involves more than speaking with airline attendants. It’s about understanding regional dialects and accents. On a recent trip it was fun listening to a mix of Southern and Midwestern accents. It’s knowing that “pop” is the same as “soda.” Overseas I had to really listen to colleagues because English was not a first language. Despite that, we all understood each other because we took the time to really listen. If you don’t try to communication, your destination will remain unreachable. Experiences are the best part of travel and why most people travel for leisure. It’s about the ability to get away from the every day. Travel provides opportunities to learn and explore. How open are you to the new experiences? Do you try the new foods? If you are overseas, do you learn some of the customs? Travel enables us to try experiences outside of our comfort zone. Freelance photographer Asra says photography is about painting with light. Asra, whose full name is Muhammad Asranur, has shot for Rolling Stones Indonesia, Spin (USA), 7×7 Magazine, the Guardian and Your Music Magazine, and recently shared photography tips with a group of writers. The shorter the time the shutter is open, the sharper the photo will be. The closer you are to your subject, the more blurred your background will be. Use as low an ISO setting as possible because the higher the ISO, the more the quality of the photograph is degraded. Hold your hand under the lens to support it and keep it steady. Hold your breath when you shoot and, if possible, lean against a wall. Get as close to your subject as you can because it will give you more drama. He also recommended always carrying spare batteries or battery packs. When not using the camera for a while, Asra said to remove the batteries so as to not drain them. Many years ago, Julie Campbell attended her first literary awards at the Library of Virginia. Never did she dream she would be up on stage accepting an award for a book that she had written, but that’s exactly what happened during the 14th annual Literary Awards yesterday. Julie won the People’s Choice Award for Nonfiction for her book, The Horse in Virginia: An Illustrated History. It explores the history of horses in Virginia during four centuries, including how the horse fit into society at any given time. The University of Virginia Press developed the concept and hired Julie to write it and find the illustrations. The evening was all the more special because she had always been an admirer of Earl Hamner, who was the force behind the semiautobiographical television series The Waltons. During the Literary Awards Hamner was honored with the literary lifetime achievement. If you want to achieve your ultimate dream, you’re most likely going to have to take something off your plate. That is the advice of John Fulwider, a consultant, coach and connector, who spoke at the 2011 NFPW conference. To make a dream a reality, you need to make a "Not to Do List." Using a workbook he had developed, he jogged participants through the steps to begin the fulfillment of their dreams. Participants had to write down their goals and make them SMART (specific, measurable, achievable, relevant and time bound), and they had to address the scoffers. “Those are the people, who say – wrongly, of course, that you can’t possibly pull it off,” John told the group. He challenged participants to identify their dream – what they are passionate about. For many in the room, it was a time to ponder and at least begin to identify the steps necessary to make the dream a reality. Often, that means identifying what one must give up to make it happen. I’m working on a mystery manuscript. I put it on hold while I transitioned into a new job and served as president of NFPW. Now, I’m ready to pursue this dream. I’m not taking on new commitments, and I’ve identified time to write. I’m going to stop spending hours on the weekend lost in HGTV, but will instead write. As part of the exercise, we also identified a personal board of advisors – those individuals who can help make the dream a reality. I’ll be reaching out to these people in the coming months. These advisors will help with editing, finding an agent and publicity. Most importantly, they’ll be there to help me over the hurdles and cheer me on. Dreams don’t just happen, but John gave the participants a list of specific, measurable and achievable objectives to start work on immediately. Now that I have my plan, it’s time for me to finish the manuscript and turn this dream into reality. What will you stop doing to make your dream a reality?